Man, if it weren’t for cows, I don’t think I’d ever be able to start my day. See, like most working adults, I stay up way too late at night and get up way too early each morning to catch the train for my long commute into work. In other words, I’m always exhausted. Don’t even think of looking at me until I’ve had that first cup of coffee in the morning. And with my coffee goes… yep, you guessed it, MILK! I just can’t drink my java black. I’ve tried and it’s just too bitter. After a few sips of my morning cow juice, I’m able to stumble to the pantry, grab some cereal and pour it into a big ol’ bowl along with some, yep, you guessed it, MILK! So as you can tell, without milk I wouldn’t be able to eat breakfast everyday or even wake up! So to all you hard-working cows out there (Yes, even you, Bessie), a big hearty thank you from my morning to your day. Okay, so milk may not improve my spelling, but it is fortefied with loads of protein. In fact, there’s 8 grams of protein in an 8-oz. glass! Pretty solid, huh? I know, I missed my calling. But what I don’t miss is my daily intake of milk! And you better believe I’ll be singing that song till the cows come home. This post was sponsored by The Life of Dad, LLC. They paid me to write this post and video my kids beating me at arm wrestling. Only in America. All thoughts, opinions and embarrassing situations are entirely my own. The only one that drinks milk in our house is our little one. And it has to be chocolate. 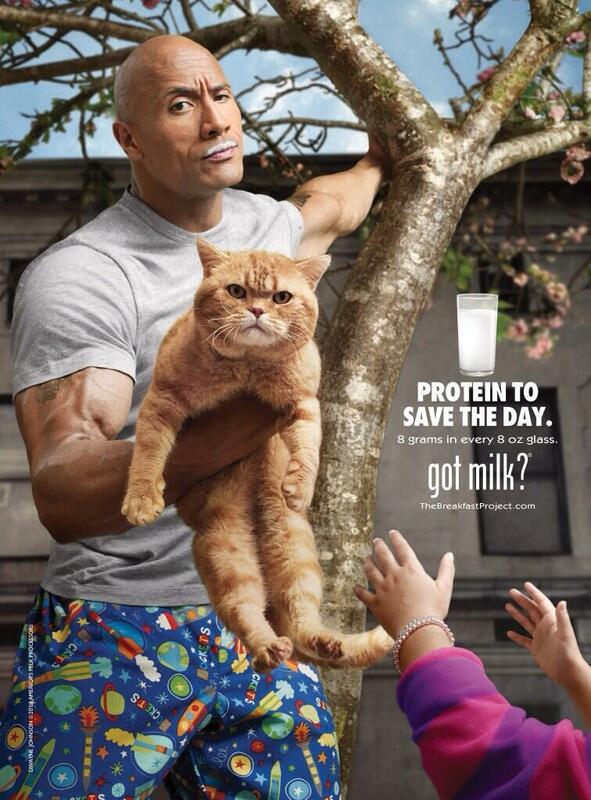 But I would drink more milk if it meant I could squeeze Dwayne Johnson’s arms. ha ha! love this.. love the rock- and of course milk! Man I love Kows – how funny. Very impressed with your hairless chest! TMI, but I waxed it!! I SOOO want to have breakfast with the Rock! My sister owns an Outback in South Florida and he use to visit with his family. His rep would call ahead of time and they would section off one side of the restaurant so he and his party were secluded. As for milk love it! Good Luck on the contest that is not bad chances. Good luck winning! We love milk at our house too!